Phase 14 of sidewalk work on Fullerton Avenue is now complete. 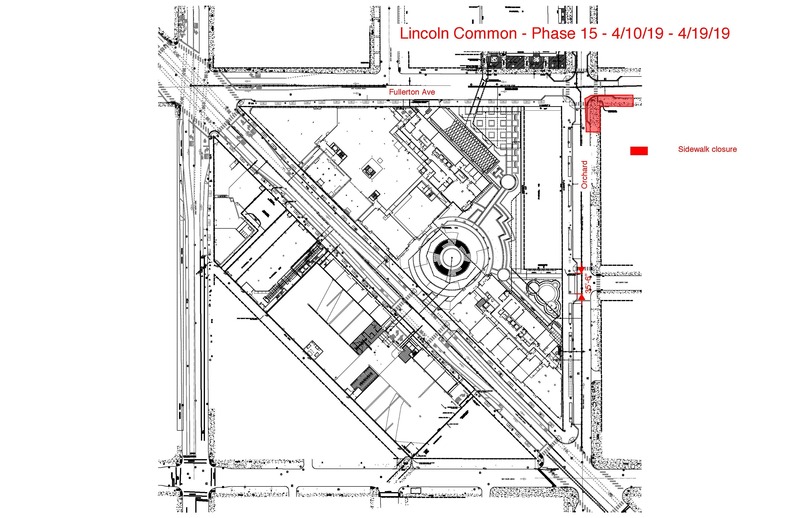 Sidewalk work Phase 15 (logistics plan above) will begin Wednesday, April 10th and continue through Friday, April 19th. During this time, the sidewalk at the southeast corner of Fullerton and Orchard will be closed so that new sidewalks and curbs can be installed. Vehicular traffic will not be impacted. Thank you for your continued patience as Lincoln Common comes to life! For additional project details, please visit LincolnCommon.com.